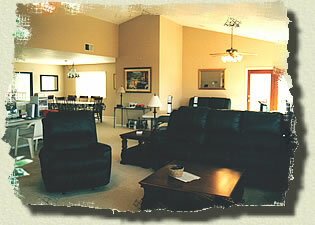 We are excited to offer a flexible and accommodating retreat location in Central California. Camp Crop's Lake Nacimiento location is available year-round and features “Scrapbook Sleepovers” where you can use our 2800 sq. ft house and organize your own scrapbook getaways. Lake Nacimiento is located on the Central Coast in the beautiful oak covered foothills, east of Hearst Castle. Our new location is an easy and gorgeous 30 minute drive from Paso Robles. San Luis Obispo Airport is 50 minutes south. Arrival and departure times are arranged to meet your needs. The house is fully furnished. The beds will be made and waiting for you, complete with fresh linens, pillows, and blankets. Fluffy towels and washcloths are also included. 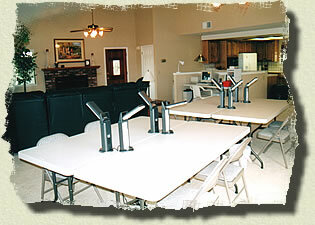 For your scrapbooking convenience, tables, card chairs, and desk lamps will be set-up and waiting for you. The kitchen is fully stocked with most conveniences, including cookware, microwave oven, dishwasher, coffee maker, toaster and can/wine opener. Guests will need to bring their own food and drinks; however, basic staples will be provided (i.e. spices, oil, coffee and filters, paper products, soaps, dish towels, etc.). Additional amenities include five bedrooms, 4.5 baths, huge scrapbooking room, outdoor deck, television with DVD/VCR, central heating and air conditioning. Please no pets or smoking.